Trigger Pull: The ASG Dan Wesson Revolver has a very predictable trigger with the single action having a lighter pull as you would expect. Double action mode is very usable without a lot of extra pressure required. Shooting this gun in single action is a lot of fun, kind of like the old west days! Accuracy: I shot the Dan Wesson revolver at a target from 20 feet out in a free standing position, and it performed well, getting close to a 2-inch grouping pretty well centered on target. The sights are adjustable for elevation and windage so if you find yours shoots off just a bit, you can easily adjust them. My Chrony testing with six shots averaged 345 FPS. 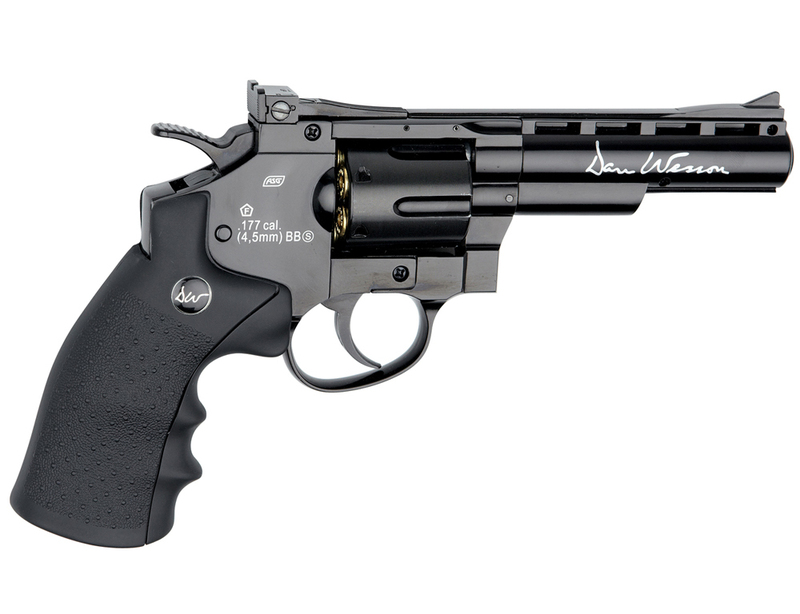 Build Quality: This fine revolver is well built, just like its Dan Wesson 6-Inch Silver and 8-Inch Black counterparts. The fit and finish looks very nice and it performed very well without any problems loading or shooting. Realism: The ASG Dan Wesson BB revolver is as close as you can get to a real six shooter. ASG didn't leave any detail out and thought of a few I may have never even dreamt up! Loading and ejecting actual brass shells into the cylinder makes you feel like this gun is much more than an unassuming airgun! One of my favorite airgun revolvers for sure! If I could have dreamt up this gun I don't think I could have done as good a job! Comments: I'm not really a revolver person, but the Dan Wesson really looks good and is very fun to shoot, making this gun a really nice change from the usual semi-auto pistols I usually like to purchase and shoot! And with 4 barrel length and various designs to choose from, it shouldn't be too hard to find one that you like. Heck I like them all! 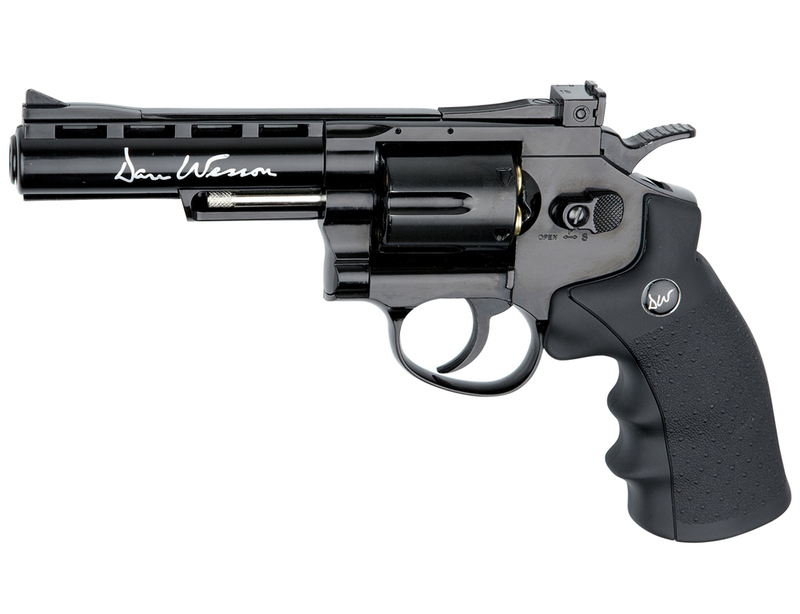 http://www.ReplicaAirguns.com - ASG Dan Wesson 2.5 inch Silver & 4 inch Black CO2 BB Revolver Review. This video is a walkthrough review of the ASG Dan Wesson 2.5 inch Silver and 4 inch Black CO2 BB Revolvers. I show off these guns close up from all angles and point out the all metal construction and the incredible attention to realism these gun offer. I also show you targets for both of these revolvers that I did a 6 shot accuracy test, from 20 feet out in a free standing position. I test the feet per second of the two barrel lengths using a Chronograph to see if they compare to the manufacturers stated fps. These BB shooting revolvers go beyond realistic and give you the feeling you are shooting a real six shooter you can shoot in your back yard without all the danger and noise and for a fraction of the cost of a real gun. These revolvers would make excellent training weapon as they work and look identical to the real steel in every way! Could not load video info.